Late this fall, I had the opportunity to tour this newer chalet-style log sided home located on approximately 5 wooded and very private acres south of Hayward in the Bass Lake township. 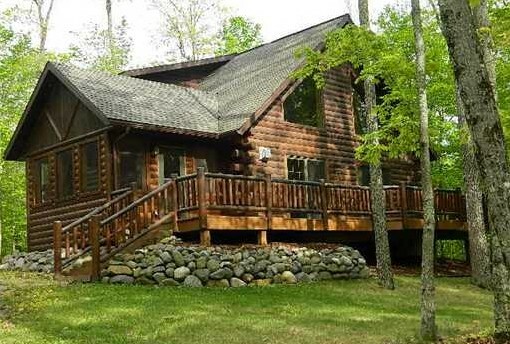 This home is located only a few minutes away from boat landings on Grindstone Lake, Lac Courte Oreilles, and Windigo Lakes-spectacular fishing and recreation convenience without the higher lakefront taxes! The winding gravel drive leads you upwards through the heavily wooded hills to a nicely landscaped clearing where the home and 2-car detached garage are situated. The rear of the house is adorned with a real log-rail deck and a covered entry area. The rustic kitchen welcomes you at the back door, and the black appliances are a nice offset to the knotty pine decor throughout. The kitchen flows right into the bright living room which showcases the beautiful cultured stone fireplace in the corner. A vaulted ceiling and expansive windows create a feeling of spaciousness. This ‘heart of the home’ seems a peaceful and relaxing place where family and friends could gather to visit and sip hot chocolate in front of the fireplace. Should you wish to sit outside on a balmy summer eve, or relax with your coffee on a crisp fall morning, you can step out onto the screened porch off the living room. Plenty of windows offer a view of the birds and other wildlife sure to pass through. 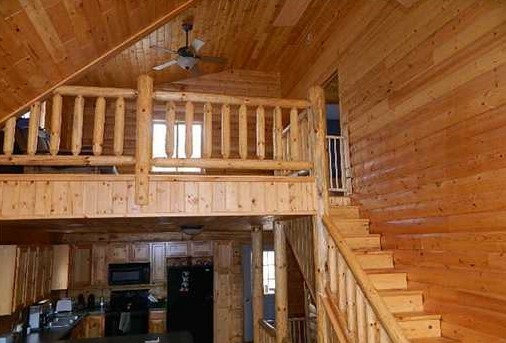 The spacious log-rail deck spanning the front of this home overlooks the seemingly endless, placid woods. The large master bedroom is on the main level and is met by a full walk-thru bath which can be accessed from both the bedroom or the back entry hall area. You will be impressed by the unique lofted upstairs, the knotty pine finished family room in the lower level, the other two bedrooms and a second bath and laundry area. This home also has plenty of storage for all your treasured belongings. This house will satisfy your desire for a newer chalet on a tranquil, private, 5 acre parcel yet it is close to town and popular area lakes, all at a fantastic price. Want even more land with this home? 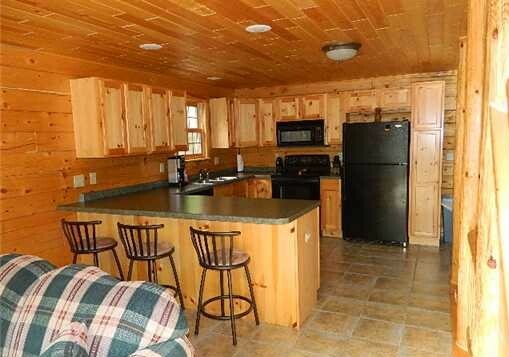 It is also available with just over 10 acres of wooded land for $269,900. Please contact me if you would like more information on this spectacular home in Hayward. Thanks for visiting my blog. 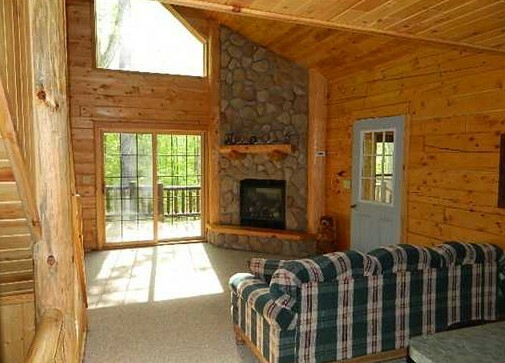 This entry was posted in Chalets For Sale Hayward, FEATURED PROPERTIES, wooded chalets and tagged area north realty, cabin in the woods, cabin with acreage for sale in hayward, cathy lareau, Chalet, chalet home for sale in Hayward, Grindstone Lake, Hayward Wisconsin, Lac Courte Oreilles, log cabin for sale in hayward. Bookmark the permalink.